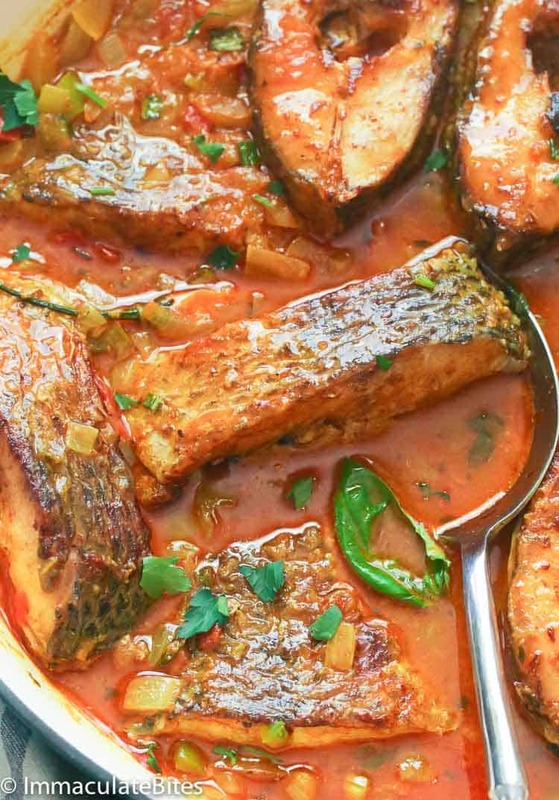 Curry Fish – spicy, savory fish meal simmered in aromatic spices and herbs with coconut milk and homemade curry powder. An extremely delicious weeknight meal just in time for the Lenten season. Now that we’re officially in the month of March, I’ve been adding great menus for the Lenten season that could also double up as simple yet great weeknight meal for the whole family. 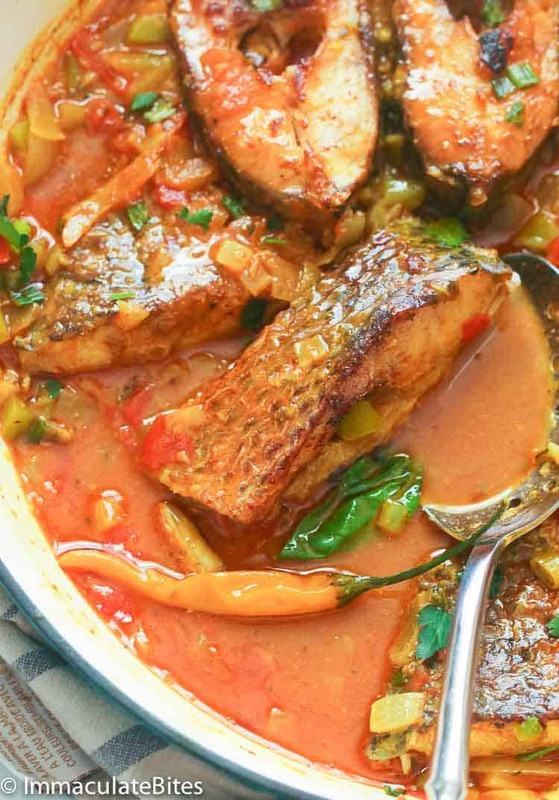 Since I’m in a fish kick lately (I’m talking about you salmon..yes, you), I decided to take it a notch higher – deep flavors and a handful of spices and herbs. 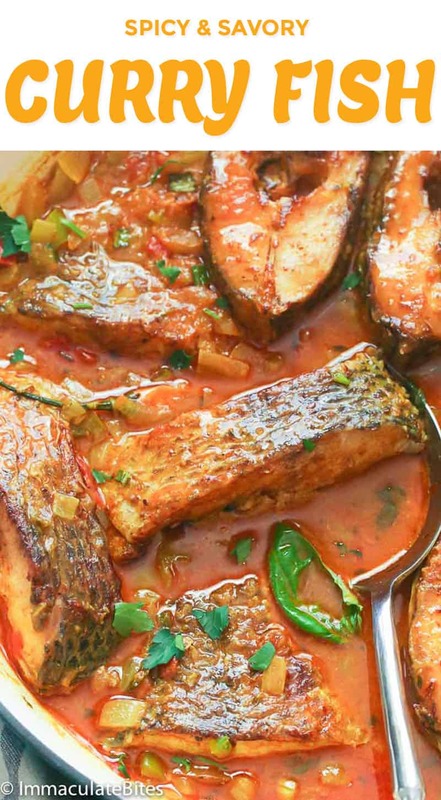 This Curry Fish is definitely the perfect answer to those who want a meal bursting with complex flavors. Made with my homemade Jamaican Curry Powder here, this dish is the epitome of simple dish without compromising the flavor. 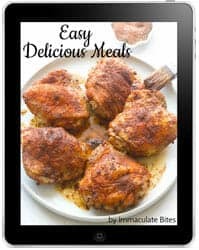 It’s pretty straightforward, no complicated cooking method at all, but the flavors taste like it has been prepared by a seasoned cook who’ve been laboring in the kitchen for decades. Deceiving, huh? So what makes this a winning dish? 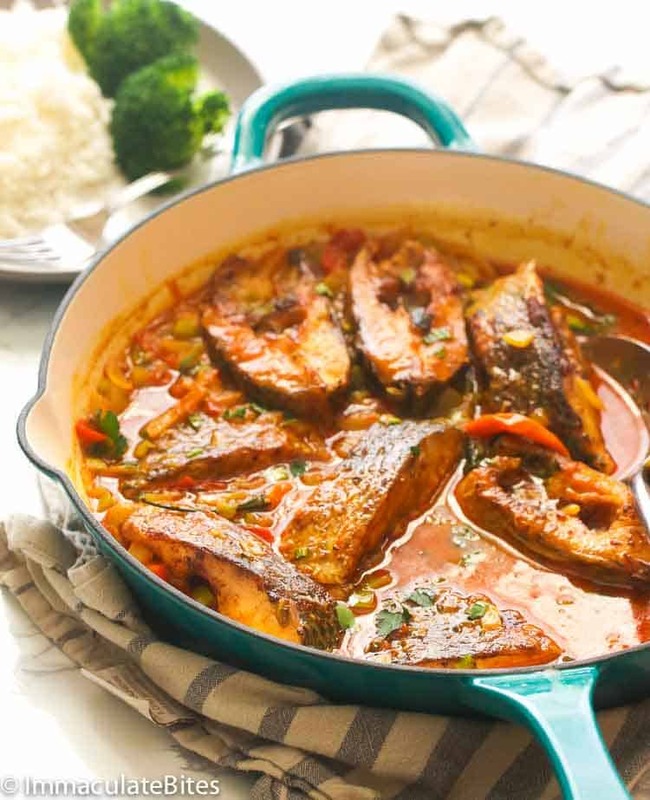 This Curry Fish here is a spin off of this big hit Jamaican Curry Shrimp here but with the addition of ginger and a couple of herbs to add depth. I couldn’t even describe best how all the layers of flavors linger in my mouth, and it’s not even overpowering. If you’re pressed with time, you can use store-bought curry powder, but I highly suggest that you try making my homemade curry powder. You’ll never buy the branded ones and you’ll have people asking what’s your secret weapon. Sounds fair? Serve this dish warm with rice, and you’ll surely be licking your plate clean. Enjoy! If you love curry anything, I would urge you to make your own spice blend – It’s like night and day- so much flavor in homemade – feel free to try this Jamaican curry out . For my Healthy. Peeps , skip the browning at the beginning . A Cast Iron works best when browning fish- works like a charm , each time. If you can do invest in a Cast Iron, it’s one of my favorite pots . It’s quite affordable too. Season fish with, salt, curry powder, white pepper, ½ teaspoon garlic and set aside. You may do this overnight and refrigerate until ready to use. In a Cast Iron Skillet, heat oil over medium heat until hot, and then add the fish and brown on both sides - about 3-5 minutes until fish is brown. You may omit this part, if desired. Remove fish and set aside. Drain oil and leave about 2 tablespoons. Add onions, followed by minced garlic,ginger, thyme, curry powder and bay leaf, stir for about 2-3 minutes for the flavors to blossom, then add tomatoes cook for another 3 minutes. Pour in coconut milk and water, continue cooking for about 3-5 minutes. Then throw in hot pepper, if using any, bell pepper, basil leaves and smoked paprika. 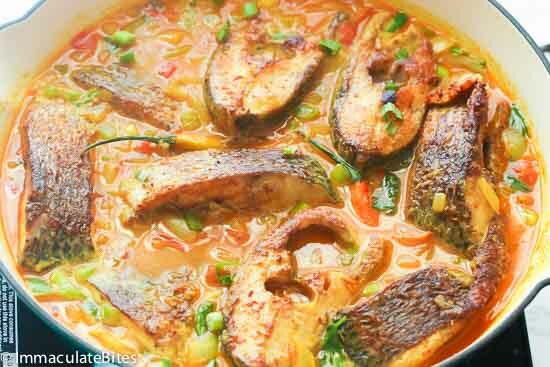 Return fish to the pot with accumulated juice. Bring to a boil, salt and cook for about 10 minutes. Add chopped parsley. Adjust sauce thickness and seasoning with water or broth. In a Cast Iron Skillet, heat oil over medium heat until hot, and then add the fish and brown on both sides – about 3-5 minutes until fish is brown. You may omit this part, if desired. Remove fish and set aside. Drain oil and leave about 2 tablespoons. Add onions, followed by minced garlic, thyme, curry powder and bay leaf, stir for about 2-3 minutes for the flavors to blossom. Then add tomatoes cook for another 3 minutes. Pour in coconut milk and water, continue cooking for about 3-5 minutes. Then throw in hot pepper, if using any, basil leaves ,green onions and smoked paprika. Return fish to the pot with accumulated juice. Bring to a boil, salt and cook for about 10 minutes. Add chopped parsley. Adjust sauce thickness and seasoning with water or broth. Serve warm. Thank you so much. 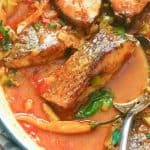 Even my husband can eat fish with your recipe! So happy to know that. And thank you for dropping by. Oh wow!!! Love it love it. I couldn’t find tilapia so I opted for pangasius. Awesome! This one here is an absolute keeper. This dish was delicious and a HUGE hit with my husband and my son. My son typically does not like fish but when I made this he asked for seconds. Thank you so much for posting! Can’t wait to make this again. Wonderful dish! So glad you shared this recipe with us..I overlooked the fish a tad but the flavor overwhelmed the mistake. Everyone truly enjoyed the meal. Hi, Also when you use the broth. Hey there, it’s been updated to make it clearer. Thanks for bringing this to my attention. 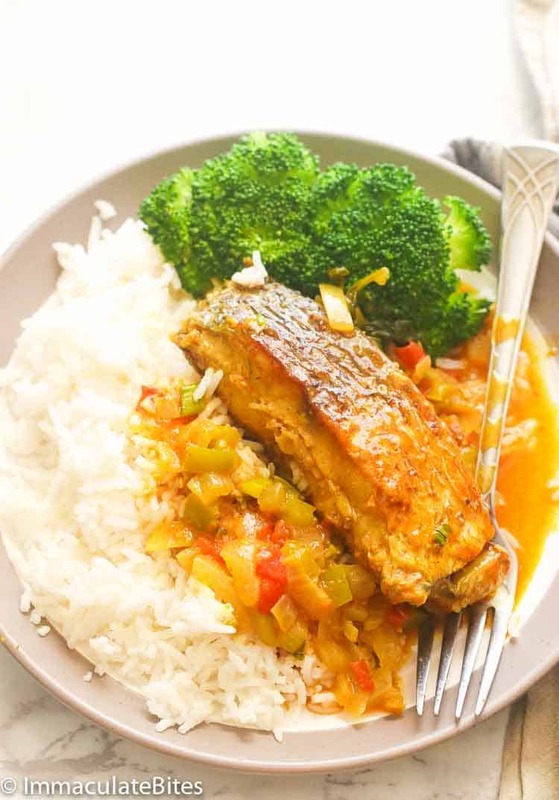 Hmm, I’m here wondering back and forth if I should make this today with my Red Snapper instead of your recent Fricassee dish for which I was gonna use the Red Snapper also. So much deliciousness to be had. Really lovely the dish and making either would be delicious. Good Caribbean style flavored curry makes a huge difference for this I know and surely got allot of that which I luv. And I agree making your own curry is so much better in knowing what your getting in flavor. I’m sure I’ll do the usual and decide which I’ll actually make as I start prepping and chopping something.